Fr. Mark from EWTN’s Life on the Rock just invited me to be his guest on Life on the Rock Thursday, December 11. I accepted. 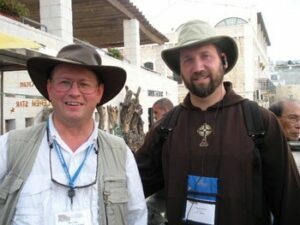 He joined us as a spiritual director on our November pilgrimage to the Holy Land. You can see my videos of Fr. Mark and out trip here and his blog on the trip here. For future pilgrimages, click here. We will be dicussing our pilgrimage together and our current pilgrimage through Advent. I am looking forward to the show. It airs live on Thursday at 8 PM Eastern and has encore shows Friday 1 AM, Friday 1 PM, Sunday 11 PM. You can listen live at www.EWTN.com. Interesting Speculation: Is Obama Constitutionally Qualified to Be President? UPDATE 12-04-08: There is an organzation called “We the People Foundation” that is taking out a full page ad in Thursday’s Chicago Tribute asking President-elect to prove his citizenship. You can see the full page ad here. The Chicago Tribute article on the matter can be read here. The Supreme Court is scheduled to hear and rule on this on Friday. Apparently, according to some, Obama has been unable or unwilling to prove that he is an American citizen according to the requirements of the Constitution. Some feel this could cause a constitutional crisis. I just post this as an interesting news item. Interesting, hum! To read about one legal avenue being taken, read here. Brought up by MSNBC News here. This morning I did a show with Sean Herriott on Morning Air with Relevant Radio. We discussed the ever-virginity of Mary. I promised to make available some of the resources I used. So here they are. 1) In Numbers 30 vows taken by married women showing that a pledge to abstain from sexual relations even within a marriage was not unheard of, even provided for in the Old Testament. 2) St. Jerome against Helvedius from around 380 AD. Helvedius dared to question the ever-virginity of Mary suggesting she had other children. St. Jerome blasts Hevedius and demonstrates the mind of the early Christians. 4) St. Thomas Aquinas with the reasons why Mary’s ever-virginity is affirmed by the Church. 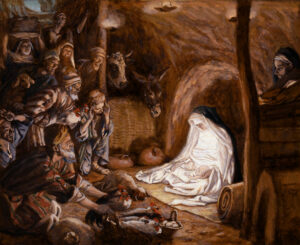 5) The Perpetual Virginity of Mary by Bro. Anthony Opisso, M.D. Of course there are many more but this is a beginning.